A sensing configuration for monitoring of fluid evaporation using fiber loop ringdown spectroscopy is proposed. 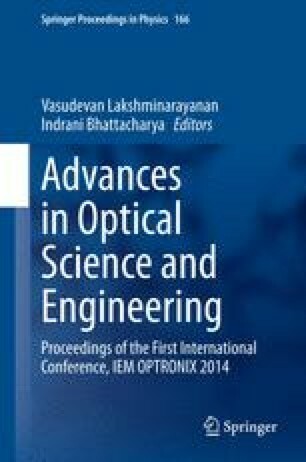 The sensing is induced by evanescent field scattering of the volatile liquid and the effect of optical light passing through the fiber cavity. A D-shaped fiber is fabricated in-house and deployed in the optical path for the evanescent wave interaction. The evaporation process of Ethylenediamine (EDA) is observed in terms of ringdown time variation. This configuration can be used to detect and study the evaporation rate of different volatile organic compound in time domain. The research work is supported by the sponsored project (No. GAP0141) from DST, Govt. of India. The author would like to acknowledge the support of the Director, CGCRI, Dr. Mukul Paul, Dr. M. Pal and Dr. Shyamal Das of FOPD, CGCRI, Kolkata for their help.